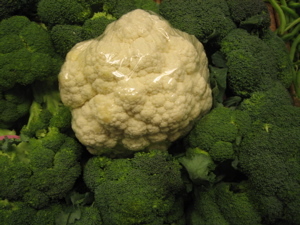 I did not really eat cauliflower as a child but over the years this vegetable has really intrigued me. Here are a fun few facts about cauliflower. Best quality of cauliflower is in the winter, one serving can provide the daily requirement of vitamin C. It is made up of flowers that began to form but stopped at the bud stage. Flavors that compliment cauliflower: Anchovy, butter, Chervil, Chives, Cream, Curry, Garlic, Ginger, Gruyere Cheese, Lemon, Mustard Seed, Olives, Parmesan Cheese, Thyme, and Turmeric. I of course went with the GARLIC to accompany this soup. The best part is this soup has a creamier consistency but pretty healthy. Separate the cauliflower and drizzle the Olive Oil over it and place in oven for twenty minutes. In a pot sautÃ© the butter and Chopped Onion for about 5 minutes until they have soften. Add Potato, Garlic Cloves from the bulb, Cauliflower and Stock. Let simmer on medium to low heat for about 40 minutes. Remove from stove and in a blender; blend the soup until smooth and creamy. The color of this soup is very bland that is why it should be garnished with some chopped chives and Gruyere Cheese. Salt and Pepper to taste. *I Originally did not add enough stock and turns out this could make great baby food. I just had a Cauliflower Soup that was drizzeled with a Chive Oil on top. It was delicious. to give the soup some unique color, try making it with orange (sometimes called cheddar cheese) or purple cauliflower. The flavor is similar to regular cauliflower, but they retain their bright colors after cooking and have more vitimins than regular cauliflower.